RIO DE JANEIRO, Brazil (CNN) -- Debris located early Tuesday in the Atlantic Ocean off the northeast coast of Brazil is wreckage from the Air France jet that disappeared Monday, Brazil's Defense Minister Nelson Jobim said. 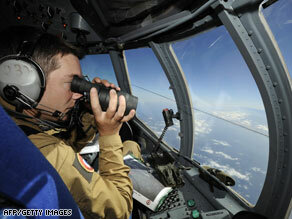 A French search and rescue crew scans the Atlantic for wreckage Tuesday. No survivors have been found, he said. Jobim made the announcement after meeting with relatives and friends of Brazilians who were among the 228 people aboard Flight 447 from Rio de Janeiro to Paris, France. Two debris fields were found about 650 km (400 miles) northeast of the Fernando de Noronha Islands, an archipelago 355 kilometers (220 miles) off the northeast coast of Brazil -- or at latitude 2 north, longitude 30 west, the Ministry of Defense said on its Web site. One of the fields was 5 km (3 miles) long and that both lie near the flight path between Rio de Janeiro and Paris. Brazilian air force planes spotted the debris field Tuesday morning, but it was not until a French commercial vessel arrived on the scene that the debris' origin was confirmed. The planes searched 10,000 square kilometers (3,861 square miles) of ocean throughout the day and will continue to search for more debris overnight, the Brazilian Air Force Said. The searchers also want to find the cockpit voice and data recorders, which might shed light on what caused the jet to disappear before any of the three pilots was able to issue a mayday. "That really is an ominous sign," said former U.S. National Transportation Safety Board Managing Director Peter Goelz. "It means, whatever happened, it happened so quickly that the pilots were not able to radio out. It probably indicates a catastrophic failure at altitude." He said that meteorologists have been checking weather data over the area "to see if there was some phenomenon that was taking place -- so far, we haven't seen it." The Airbus A330 encountered heavy turbulence early Monday, about three hours into what was supposed to be an 11-hour flight, according to the airline. The plane carried 216 passengers -- 126 men, 82 women, seven children and a baby -- and 12 crew members, Air France said. Could lightning have brought down Air France plane? The majority of the people on the flight came from Brazil, France and Germany. Other victims were from 29 other countries, including three from the United States. Of the crew, 11 were French, and one was Brazilian. A team of approximately 20 Air France staff members, including two doctors and a nurse, arrived Tuesday in Rio de Janeiro to assist families of the victims, the airline said. An inter-religious ceremony is to be held Wednesday afternoon inside Paris' Notre Dame Cathedral for family and friends of the victims. Though it will be closed to news media, a sound recording of the ceremony will be broadcast into the square outside. An official list of victims by name was not available Tuesday afternoon, but two Americans on board -- Michael Harris, 60, and his wife, Anne, 54 -- were identified by the couple's family and his employer. Prince Pedro Luis de Orleans e Braganca, a member of Brazil's non-reigning royal family, was also on the flight, his family said Monday. Pedro Luis was 26. The Air France plane has built-in homing devices, said Greg Feith, a former investigator with the U.S. National Transportation Safety Board. Homing devices such as "pingers," which are underwater locator beacons attached to flight data and cockpit voice recorders, can transmit signals from as deep as 14,000 feet, about the maximum depth of the waters in the area. The average depth of the Atlantic Ocean is about 12,000 feet: more than 2 miles. "They're water-activated, so if they're sitting at the bottom of the ocean, of course, then the military assets will have to go in there with listening devices and try and home in on those particular signals," Feith said. Shortly before it disappeared, the plane's automatic system initiated a four-minute exchange of messages to the company's maintenance computers, indicating that "several pieces of aircraft equipment were at fault or had broken down," Air France CEO Pierre-Henri Gourgeon said Monday. There was no contact with the crew during or after the time that the automatic messages were sent, Gourgeon said. CNN's John Zarrella, Kim Segal and Nesta Distin and journalist Helena DeMoura contributed to this report.